AFTER FIVE WEEKS, the strike by Wallis staff at five different stores has come to an end. 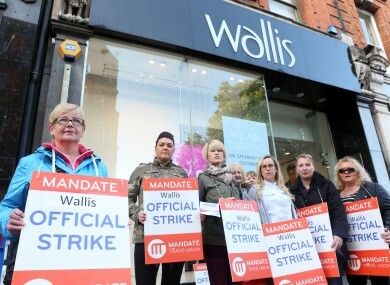 Mandate Trade Union said this afternoon that the dispute – which involves staff from Wallis stores at Cruises St, Childers Road, Grafton St, Jervis St and Clerys department store in Dublin – has ended. Last week had seen the first approach from Wallis, which is owned by the Arcadia Group, towards meeting the union in an effort to resolve the dispute. This morning, the workers involved in the strike action decided to accept a set of proposals which had been brokered between their representatives, Mandate Trade Union, and senior company management. Assistant General Secretary of Mandate, Gerry Light, described the outcome as a “positive development”, saying that there was a “significant majority” who voted to end the dispute. The final proposals represent a fair balance and choice for those who wish to leave the employment by way of redundancy whilst there are clear provisions made for those who want to stay. Speaking to TheJournal.ie, Light said that the proposals agreed on involved both a redundancy offer and redeployment offers within the company. As the company is downsizing and closing some stores, not everyone can be re-hired. However, staff have agreed to proposals that would see them being able to apply for a range of job offers from tomorrow. They can compete for those vacancies in accordance with the company’s own recruitment procedures. “At the end of that, hopefully we will have a clearer picture of those who want to go and those who want to stay,” he pointed out. There is a clause within the proposals that if somebody is offered a job, they can work it on a trial basis for a month and if it doesn’t work out for them, they can discuss this with the company. There is also provision for an independent facilitator to look at a situation if somebody is unhappy. He said that bringing the dispute to a close was not easy, and that there was the potential for it to escalate to the Blanchardstown and Liffey Valley stores, had it not been resolved today. Light also said that if it was resolved after five weeks, there was no reason why it could not have been resolved sooner, as the company only began discussions with the union last week. He said that the Labour Relations Commission has a valuable and important role in disputes such as this, and that companies should recognise the importance and value of it. Light added that it is important now for normal relations between the parties to be restored as soon as possible. Email “Wallis strike comes to an end after five weeks”. Feedback on “Wallis strike comes to an end after five weeks”.